Mac OS X is the special one in the Desktop market. So many people admire it because of its beauty, safety (yes, it is an UNIX) and its profesional image as “an OS for profesional modern art designer”. Yeah, Mac OS X has beautiful look and I do like its look-n-feel. And so, there are so many theme patcher to make our Microsoft Windows or Linux OS become Mac OS X in the appearance. In Linux Desktop, there are some project specialized in designing theme transformation pack to make our Linux desktop to be looked like Mac OS X. The most popular project probably is Mac4Lin. But, all of those projects was designed only for GNOME or sometimes support XFCE and how about LXDE? Our Star in the current lightweight Linux desktop? 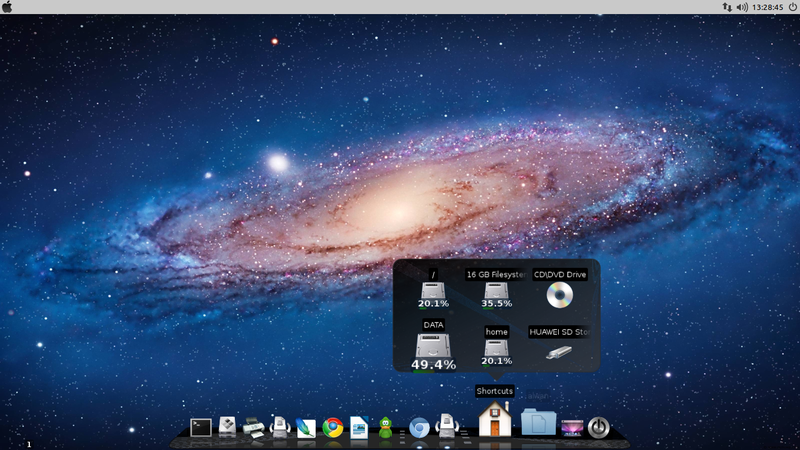 (Yes, LXDE is the most light-but-complete Linux desktop for now). Until now, there is no project that officially support LXDE. Basically, LXDE uses gtk (now still stay with gtk2) and any gtk theme can be used in LXDE. The problem is, LXDE uses openbox as its window manager. And as the logical reason for its ligthweight, openbox has limitation. Openbox doesn’t support complex theming by using high resolution png images so we couldn’t build sophisticated theme for openbox. However, we could still build window theme with color for openbox and we could try to resemble any theme we want, although it will never be pitch-perfect same as a clone. And so, there is an openbox theme tried to resemble Mac OS X theme and we could use it to transform our LXDE desktop to be looked like Mac OS X Lion. Move the Panel to the top and remove Window List (Task Bar) Applet, Application Launch Bar Applet, Minimize All Windows Applet and Desktop Pager Applet. Check the Strecth option of Spacer Applet between Menu Applet and system applet in order to get wide space between Menu and System Tray Applet.